Looking back over the stories selected for the Haynesville Play 2009 Top Ten, I note that most stories are “macro” in nature and are not so much reflective of news on the ground. To me, the big theme for 2009 was the “adolescence” of the play. The land rush is over and the production has begun in earnest, but it is still in the early stages. While there are big wells being produced, the future of the play is still unknown. Shale plays are reshaping the energy landscape in the U.S., but at the same time outside events are impacting the future of the shale plays. As a result, I saw many of the external issues with long-term implications as somewhat more important than the daily news. Chesapeake, Petrohawk announce they have hit 500 MMcf/day production levels. That’s a lot of production for a couple of companies in a play that is only two years old. Devon hits a big well in San Augustine Co. TX. The Kardell Gas Unit #1, also owned by Crimson Exploration, came in with a 30.7 MMcf/day initial production rate, stoking greater interest in the southern part of the Haynesville Shale, especially on the Texas side. Safety. This past year saw several accidents that resulted in death and injury. While drilling is widely recognized as a dangerous occupation, the high pressure wells of the Haynesville Play can be particularly dangerous. With another serious injury on a well earlier this week, the issue isn't going away. Groundwater. This story seems to be resolving itself as producers play nice and work to find water sources other than the fragile aquifers of north Louisiana. Naysayers. There are some prominent energy industry professionals like Matt Simmons and Arthur Berman very publicly criticizing shale gas. While their arguments have been contested by others, some doubt persists. There is not enough definitive data to say who is right, nor is it possible to separate the fact and analysis from an underlying agenda than an individual might have. We’ll just have to watch the drama play out in 2010. 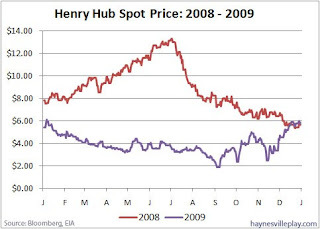 The Henry Hub natural gas spot price closed at $5.83/MMBtu today (Dec. 31, 2009). Compared to last year's close of $5.63, this represents an increase of 3.6%. This slight change in no way reflects the lows ($1.88 on September 2) or the often insane volatility for the year (especially from September to November) of the past year. I accumulated the data for the chart below, and it shows how divergent 2008 and 2009 were but how closely they ended. The Baker Hughes rig count showed an increase of 11 rigs in the U.S., bringing the total number of active rigs to 1,189. Gas rigs increased the most (+8), followed by oil (+2) and miscellaneous (+1). Most of the new rigs were horizontal (+7), followed by vertical (+3) and directional (+1). In the Haynesville region, which is inclusive of other formations, the rig count increased by five, all in north Louisiana, to 186. I have updated the rig count spreadsheet in the upper right hand corner of the site. It is current for Louisiana wells only. I counted 116 active Haynesville wells in north Louisiana. I ended up deleting an existing well (Matthews 16 #2 - 239021) that I couldn't confirm was a Haynesville well. As expected, the EIA's weekly report of natural gas in storage showed a decrease of 124 Bcf to 3.276 Tcf. The decrease was in line with last year's decrease (144 Bcf) and the five year average (120 Bcf). While it is still more than 13% over the five year average, as the chart below shows, it is getting close to re-entering the band of the five year range. Withdrawals were largest in the East Region (90 Bcf), followed by the Producing Region (23 Bcf) and West Region (11 Bcf). To me, the most interesting story this year in the Haynesville Play is the rather dramatic shift of corporate business plans to focus on domestic natural gas, specifically shale gas. The year began with Chesapeake Energy inking big deals with foreign producers to help fund its shale ambitions, but it ended with Exxon buying XTO Energy. The Exxon/XTO deal will get lots of attention because Exxon is the biggest of the big daddies and because it is very much outside of Exxon’s character to make big corporate acquisitions. Given its size, for Exxon to be interested in pursuing an opportunity, it has to be big. It seems as though Exxon has identified shale gas plays as a “manufacturing” opportunity where the company can put huge amounts of capital to work to extract a significant return. There are several companies out there that already are “suiciding” on particular shale formations (i.e. Petrohawk, Goodrich Petroleum), but more and more companies are changing their business plans to concentrate on domestic shale gas in general. This change in strategy comes at the expense of other business lines (like midstream), geographic diversification, corporate debt load and in some cases near-term profitability. Recently Devon announced that it is selling its international and Gulf of Mexico assets to focus on domestic production (the company has more than a half million leased acres in the Haynesville Shale). El Paso, too, is narrowing its focus on domestic gas production, so much so that it has stated plainly that it will outspend cash flow in the short-term. This is important because it means that the large independent gas companies (and now Exxon) are further committing themselves to pour billions of dollars into producing areas like the Haynesville Shale. They are betting the futures of their companies on these big plays. Nobody has a crystal ball to say that these are the right decisions, but the continued high level of spending will give the Haynesville Shale the chance to blossom. Ultimately, the Haynesville Shale will not be developed unless the E&P companies make the investment, and making the investment they most assuredly are. Spending is the key, and that’s why it is my #1 story for the year. The longstanding dominant perception of the natural gas industry was that we were going to run out of gas in our lifetimes. With the advent of shale gas production, that paradigm has been smashed. The new paradigm, which is gaining gradual acceptance, is one of natural gas abundance, not scarcity. This is a big deal and is still a work in process as the word continues to get out. But the big news is that the word is, in fact, getting out. Earlier in the year, the Potential Gas Committee reported that gas reserves in the U.S. are approximately 2,074 Tcf, an increase of 35% from the previous report two years ago. The promise of shale gas has reinvented the domestic natural gas industry. What is really astonishing was that as rig counts were cut by more than half over the past 15 months, gas production continued to grow. The major gas-in-storage drama of the past six months is a direct result of strong wells putting up big numbers with fewer drilling rigs. If, for some reason, production in North America were to flag, there will be gigantic LNG tankers at major ports lined up to take up the slack. This change in perception is big because when key decision makers in government and business understand that natural gas is a plentiful, dependable resource, consumption will increase and natural gas will be closer to widespread use. Watching the rise and fall of gas prices has been a dizzying experience. 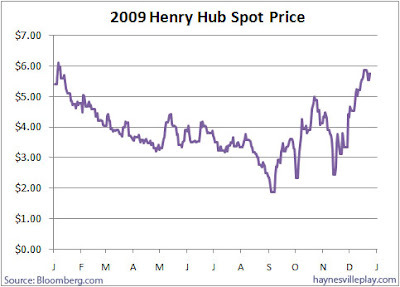 I closely follow the Henry Hub spot price as a barometer of the short-term market value of natural gas and because it fairly closely mimics prices one might see on a royalty check. After peaking over $13/MMBtu last year, prices slid for the rest of 2008. The slide continued in 2009 as demand flagged in a recessionary environment. The combination of higher production from shale wells and decreased consumption caused gas in storage to swell well beyond previous records. The belief that storage might be exceeded was one of the main causes for prices to sink throughout the year. The spot price dipped as low as $1.88/MMBtu at the beginning of September before recovering to the upper $5’s in December, approximately where it started the year. Year end statistics might show a +/- 5-10% change in price, but that will be no indication of the price volatility or how close the price came to scraping bottom. Beyond the impact to a land owner’s pocketbook, commodity price volatility is not good for natural gas. If the industry wants to convince prospective users of the benefits to switch to gas, price volatility is a huge negative. The price outlook going forward is not great. Most analysts don’t expect gas to exceed $6.50 to $7.00/MMBtu for the next decade because of the growth in available supply. Because of the number of shale wells being drilled, oversupply will continue until there is a major change in consumption patterns. One of the big discussions this year was at what point are shale wells economically feasible? If commodity prices remain low for a few years, we are going to find out. 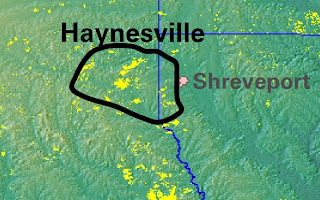 Remember that old Reece’s Peanut Butter Cup commercial, “two great tastes that taste great together?” That’s what the Haynesville and the Middle Bossier Shales represent to me. 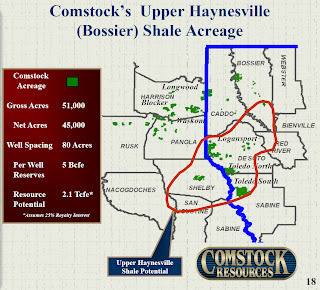 While the Mid-Bossier might go by other names, it is the shale formation directly above a large swath of the Haynesville Shale. It was formed about 30 million years after the Haynesville and has somewhat different boundaries. Although they are the same types of geologic formation (not different like chocolate and peanut butter), their juxtaposition creates a wonderful stacked play for many land owners who have two huge natural gas formations beneath their feet. The Mid-Bossier became a topic of conversation this summer when EnCana featured it in an analyst presentation. Since then, other producers have shared information and a few have drilled wells into the shale. 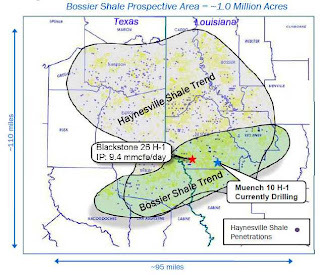 Because it is shallower than the Haynesville Shale, the Mid-Bossier likely will not be developed in large scale until producers secure their leases in the deeper Haynesville Play. 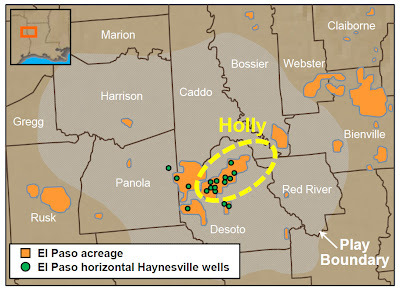 While several producers suggest that it is not as rich a formation as the Haynesville, it is still a very significant find and will keep the drilling activity in north Louisiana and east Texas humming for a long time. One of the biggest stories anywhere this year has been the worldwide recession. From my perspective, one of the most interesting stories in the Haynesville Play has been how we have survived the recession and even thrived a bit given the chaos around us. Sure, decreasing demand for gas nearly caused an overflow of storage facilities and crushed gas prices along the way, but in the Haynesville Shale the rigs kept digging and the gas kept pumping. Since September last year, national rig count plunged more than 50% as production companies slashed capital spending budgets. But budgets in the Haynesville Play have been fairly resilient as production companies need to prove their leases so they can hold them by production. What that means is that hundreds of millions of dollars have been poured into Haynesville leases this year, while rigs all over the country are collecting dust. Things tightened up in the Haynesville Shale, but the activity continued to grow. Looking at north Louisiana rig counts as a barometer, they are up 37% over the end of last year, and the year-end figure last year was 84% higher than the rig count from mid-March 2008 when news about the Haynesville Shale broke. While that is not a pure measure of Haynesville activity, it gives an indication that activity has remained pretty steady in the teeth of the worst economic climate this country has seen in 80 years. This data is particularly interesting when viewed in the larger context. Over the past year, the north Louisiana rig count has jumped from being 6.7% of the U.S. gas rig count to 16.4%, as shown below. I can’t say that the production companies aren’t losing their shirts ramping up drilling and production in this environment – I’ll leave that for others to decide – but they are pouring tons of money into the region and creating an avenue of wealth for land owners. This year marked the first time that the natural gas industry has fielded a legitimate consolidated national lobbying effort. Between public outreach campaigns (“Eureka!”) and old school backroom lobbying, the industry finally made its voice heard. I said it several times this year, but the mantra of all lobbyists is, “if you’re not at the table, you’re on the menu.” This year we saw natural gas move from the menu to the table. The industry has a great story to tell and now someone finally is listening, but there is still much to do to catch up to the coal and utility lobbying groups. Last year ended badly for coal. The company enjoyed high prices for eastern and Midwestern coal throughout the year, and then Barack Obama was elected president, so the industry lost its friends in the White House. Then three days before Christmas all hell really broke loose, literally, when a dike holding back a retention pond filled with fly ash from a Kingston, TN gas-fired power plant ruptured, releasing 1.1 billion gallons of the coal byproduct into the Emory River. The spill quickly inundated homes and vast sections of land downriver with thousands of tons of hazardous material. That was just the beginning. With a new focus on U.S. energy policy and the impact of climate change, coal, which emits huge amounts of carbon when burned, became branded as a major polluter to a wider audience. Then came the full impact of the recession. With lower electricity usage, power plants, one of the few remaining consumers of coal, required less coal. Then natural gas prices cratered and power generators started switching to gas, which was cheaper than coal at the time. Mountains of coal collected as supplies swelled. Coal companies cut back production, but the surplus mounted. While “clean coal” was a rallying cry on the campaign trail for all candidates in 2008, reality hit in 2009 when nobody could predict when carbon capture and sequestration could work at a large scale. It is certainly not a realistic solution to cutting carbon output in the short-term. While the coal lobby is still strong in Washington, it couldn’t stop the EPA from beginning the process of regulating greenhouse gasses and treating carbon dioxide as a pollutant, nor could it prevent the denial of some mountaintop removal mining permits. Even the market is starting to turn against coal. With the belief that there will be greater regulation of pollution and carbon, power companies cancelled the construction of new coal plants and began the process of shuttering old ones. North Carolina’s Progress Energy made news a few weeks ago when it announced it would close 11 coal plants over the next seven years. Coal is getting it from all sides. While the industry is strong and its defenses are well capitalized, it is gearing up for the fight of its life. Please have a joyous and wonderful Christmas. Today, the EIA reported that natural gas in storage was down 166 Bcf to 3.4 Tcf. Last week's decrease outpaced the same week last year (-144 Bcf) and the five year average for the same week (-128 Bcf). While this is promising, the gas in storage figure is still 11.8% higher than last year's figure and 13.1% higher than the five year average. At least it's headed in the right direction. Natural gas is an important fuel in Europe and has been gaining acceptance in developing nations like China and India. But events in 2009 changed how natural gas is perceived and traded worldwide. Probably the largest impact came from the completion of several large international gas liquefaction plants, especially in Qatar. Because natural gas is difficult to transport, until this decade it has been shipped by pipeline and treated as a regional commodity. The ownership of international pipelines has long been a source of political power and cross-border angst. This year marked the completion and opening of a large amount of liquefied natural gas (LNG) infrastructure – the ability to liquefy it, ship it, receive it, regasify it, store it and distribute it – that has made gas more of a globally traded asset. With the global recession reducing energy consumption, there is excess LNG in the market. It is unwelcome in the U.S. because of our shale-induced oversupply, so immense quantities of gas are finding a home in various international ports, creating new spot pricing markets where they never could thrive before. Gas users are waking up to the fact that spot prices are far cheaper than their long-term oil price-indexed pipeline contracts and are starting to seek changes. Opening the gas market to greater competition should lead to a shift of pricing power towards end users that could impact geopolitics. If nothing else, it should lead to lower gas prices. 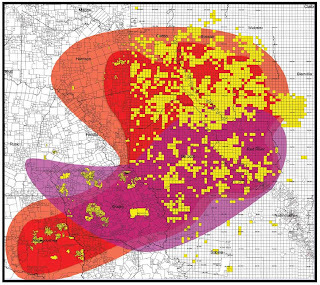 The other big story is the potential abundance of gas supply outside of traditional producing regions. Big recent conventional gas finds in Australia and Papua New Guinea along with the potential to produce gas from shale in any number of locations has the world rethinking natural gas. The success of shale plays in the U.S. has kicked off a scramble for the technology used to produce gas from shale. Chesapeake Energy has struck several rich “teaching” deals with international energy companies seeking to learn these techniques. Exco Resources signed a similar deal with BG Group this summer. Chesapeake is involved in a bid for gas properties in South Africa. Traditional gas producing countries are trying to create a “gas OPEC” but these efforts likely will be nothing more than trying to constrain free markets that shortly will be beyond their control. It is likely that such an organization will have short-term success, but I think in the long-term the democratization of supply will overwhelm any one group’s ability to control natural gas. Baker Hughes released the weekly rig counts a bit early because of the Christmas holiday. They showed a decrease of 15 rigs nationwide for the week. Of that net 15, there were seven new oil rigs working but 22 fewer gas rigs. By type, vertical rigs decreased by three, horizontal rigs by eight and directional rigs by four. In the Haynesville region of north Louisiana and east Texas, which is inclusive of other formations, the rig count increased by two, adding three in north LA but losing one in east TX. The spreadsheet in the upper right corner has been updated for Louisiana information. There was a lot of activity this week but a net gain of only one rig, from 114 to 115. Five rigs reappeared this week, four disappeared and 12 rigs moved from one well to another. This should be the #1 story of the year, but it’s been all sturm und drang in 2009 and not much action. With the recent UN Climate Summit in Copenhagen, the relationship between energy and the environment has been getting lots more attention. The great herding of cats in Denmark didn’t result in much direct action, but the concepts discussed should be part of international energy policy going forward. The good news from our perspective is that natural gas finally made some inroads to the conversation. I think the world is beginning to recognize the value of natural gas from an environmental and international security perspective. No victories can be declared, but natural gas officially is on the international radar. The same can be said about Washington. It’s been a wild year in D.C., well beyond my ability to comment upon or comprehend, but expect more fireworks as the energy debate heats up in January. Again, more good news: natural gas advocates are finally being heard in the halls of government. Gas offers a great many benefits to the U.S., so whatever your politics or regional preferences, there is something there for everyone. Now let’s see if the talk and potential can be translated into action. Reuters reported that Cheniere Energy's little used Sabine Pass LNG port will receive shipments from two Qatari LNG tankers before the end of December. Like moths to a flame, LNG operators see the spike in spot market prices in the U.S. now that the storage situation has eased and are directing excess supply here. Global supply and demand at work, I guess. 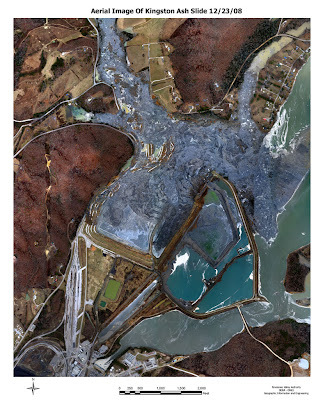 Today marks the one year anniversary of the massive spill of fly ash, a byproduct of burning coal, into the Emory River from a coal-fired power plant in Kingston, TN. The spill released 1.1 billion gallons of the material into the river, causing a tsunami of sludge that destroyed numerous homes downriver and contaminated a wide area. You can be assured that the coal industry is not celebrating this anniversary. If you want a sobering reminder of the event, watch the 60 Minutes segment from a few months ago. It will make you think twice about burning coal. In September 2009, a fish kill in Dunkard Creek, along the Pennsylvania/West Virginia border set off an important battle in the shale gas world. A spill from a nearby Cabot Oil & Gas well was blamed for the kill, but over time the reasons appeared to be more complex. That realization was too late because the first report set off alarm bells for environmentalists and nature lovers across the region and the country. The culprit became hydraulic fracturing, the technique used to extract gas from underground shale formations (as well as other reservoirs). The press and bloggers jumped all over the issue and it resurrected the discussion of why fracking is excluded from the Safe Drinking Water Act. The environmental issue is far larger in the Marcellus Shale than the Haynesville Shale, but it is one that gets a great deal of media attention and could be a regulatory headache for natural gas going forward. News that anti-fracking legislation could kill Exxon’s $41 billion acquisition of XTO made lots of news last week. There are some whispers that some of the opposition might be funded by coal interests. If so, that would be hugely hypocritical given that industry’s environmental record, but since coal is fighting for its life, it would not be surprising. Whom or whatever is behind the opposition, the public concern is real and it is one that the natural gas industry needs to face head-on. States in the Northeast have to be careful too. They should realize that in the Marcellus Shale they possess a goose with the potential to lay golden eggs. State leaders will have to balance environmental concerns with economic prosperity. It will be interesting to see how New York and Pennsylvania handle this delicate balance in 2010. The Sierra Club has to walk that same delicate line, as highlighted by a recent article in the Wall Street Journal. The national organization is advocating natural gas as a way to wean the country off coal, which it views as far more harmful, but the local groups in the Northeast are organizing against fracking. It has long been the vogue in journalism to do a year-end top ten list. Since I practice a sort of low end, black market parasite journalism, I’m feeling the need to join in. It’s been a really interesting year for the Haynesville Shale and the world of natural gas. Taking the time to write a list makes me realize that the Haynesville Play is going to have a bright future, but it won’t be without challenges. I’ll start with number ten today and add a new one each day before the end of the year. Here is a great AP article about the hopeful future of natural gas that has been picked up by numerous print media outlets. I guess the confluence of many events from U.S. climate/energy policy debate, the UN event in Copenhagen and the natural gas PR blitz are calling greater attention to our favorite fuel. PEC Minerals Gas Unit 2 #4H, XTO Energy; North Carthage Field, Panola Co.
Ironosa #1H, St. Mary Land & Exploration; North Carthage Field, San Augustine Co.
Jarry #1H, Chesapeake Operating; North Carthage Field, Shelby Co. Southwestern Energy announced its 2010 capital budget this week. The company, which mostly focuses on the Fayetteville Shale, will spend $2.1 million in capex in the coming year, up from $1.8 billion in 2009. Of that amount, $1.7 million will be spent on E&P, the lion's share going to Arkansas. Of the E&P budget, $230 million will be spent on the company's properties in east Texas, up from $160 million in 2009. That budget should allow for 50-60 gross wells in E. TX (25-30 net). Of the gross wells, 21-26 should be in the Haynesville or Mid-Bossier Shale, while the remaining 29-34 will be in the James Lime formation. While it's not a huge budget, it's nice to see some increased capital spending. We look forward to reporting some new Southwestern completions, even perhaps some in the Mid-Bossier Shale. Labels: Capital Budgets, Fayetteville Shale, Haynesville Shale, Mid-Bossier, Southwestern Energy Co.
Every day this week, the Henry Hub spot price of natural gas increased. I am fairly certain I haven't been able to say that this year. In fact, it's probably been more than 18 months. Also, for the first time this year, today's spot price ($5.87/MMBtu, +22 cents, +3.9%) is higher than the price on the same day last year (Dec. 18, 2008 = $5.63). The Baker Hughes rig count showed another nationwide increase in working rigs, up 32 from last week to 1,193. The increase was evenly split between oil and gas rigs. The increase included 14 horizontal rigs, 14 directional rigs and seven vertical rigs. It's no real surprise that the number of oil rigs (407) is more than this week last year (387), but the number of working gas rigs (773) is nowhere close to the number last year (1,366). In the Haynesville region of north Louisiana and east Texas, inclusive of other fields, the count increased from 173 to 179, with the six new rigs all working in Texas. 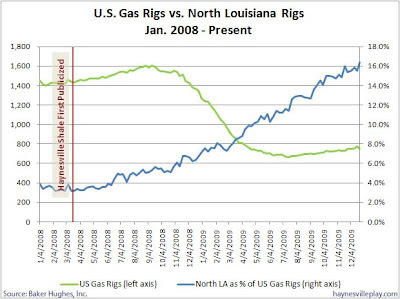 I updated my list of Louisiana rigs with new information and a couple of errors/omissions. I'm sure there are some more, but it should be an improvement over last week. Computer calamities have killed my week, so I haven't had time to work on the Texas list. The Wall Street Journal had an interesting fin de décennie article on its web site about the changes in various commodity prices between the nineties and this decade (the aughts, naughty aughties?). Of all the commodities analyzed, natural gas had the biggest price increase. The average price rose from $2.70/MMBtu in the 90's to $6.50/MMBtu in the 00's. The commodity that fared the worst? Cotton, which dropped 39% over that same period. It made me think of visiting our family property in rural north Louisiana as a child. I remember driving down Highway 1 looking at the cotton fields on both sides of the road. While driving, my father would regale us city kids with stories of cotton harvest time. Now, driving that same route you are as likely to see as many signs of natural gas production as cotton growing. I don't have hard agricultural figures to cite, but with the Haynesville Shale, it seems that natural gas has become the new cash crop for north Louisiana farmers. The weekly EIA natural gas in storage report came out this morning showing a sharp decrease in gas in storage. For the week, gas in storage dropped 207 Bcf to 3.566 Tcf. That is nearly double last year's withdrawal this week of 116 Bcf and well above the five year average for this week of 127 Bcf. In terms of region, the East Region saw a net withdrawal of 93 Bcf, the Producing Region decreased 75 Bcf and the West Region was lower by 39 Bcf. It's nice to finally see the red line on the above chart pointing down, but gas stocks are still very high, 13.8% above the five year average. The Associated Press reported that the 207 Bcf withdrawal was the biggest ever for this time of year. Temperature variance maps show the cold weather across the country that led to the big drawdown. The Louisiana completion database will be updated in a few days. My wife is a woman of few words, but when she does speak, she urges me to update my computer virus protection and back up my hard drive. I listen but sometimes am slow to act. Unfortunately, my virus protection lapsed a couple of weeks ago and I got a virus the other day that wiped out some of my favorite files, including the LA completions database and my nearly complete TX completions database. As a result, after eating a heaping helping of crow, I am in the process of rebuilding the LA file. I’m about 65% there and hope to rebuild it better than before, Steve Austin style. Unfortunately I’m going to have to start from scratch on the TX database. So gas fans out there, listen to my wife and update your virus protection and back up your hard drive. Comstock Resources announced its 2010 capital budget today. Of the total $385 million budget, a whopping $368 million will be spent on the company's Haynesville Shale projects. This budget should fund 56 gross Haynesville wells (41.1 net). In 2009, the company expects that it will drill 41 gross wells (30.6 net). St. Mary Land & Exploration announced its 2010 capital expenditure budget today. Of the total $725 million budget, $561 million will be spent on E&P efforts. Of that amount, $89 million will be spent on the Haynesville Shale. By contrast, the largest chunk, $216 million, will be spent on the Eagle Ford Shale in south Texas. Nobody can dictate where the Mid-Bossier lies. It is where it is. As companies drill more wells in 2010 the boundaries should be better defined. Unfortunately, the Comstock map won't make our friends in Bienville Parish very happy. It seemed like the perfect image to illustrate the situation where the big independents like XTO find themselves. By unlocking enormous reserves of shale gas, they’re the dog that has caught the car. But what are they going to do now? It will take mountains of cash to efficiently produce these reserves, but it will also require that the production companies have bullet-proof balance sheets able withstand the gyrations of the market in terms of volatility in demand and commodity price. That’s not possible at this stage – the big independents can have one or the other. The big gas independents can raise billions of debt and equity, but will that be enough? Apparently not for some. I read in the front page Wall Street Journal article on the deal that Bob Simpson, Chairman and founder of XTO, approached Exxon, rather than the other way around. Simpson recognized that XTO didn’t have the financial resources or borrowing power to take advantage of the opportunity. Chesapeake Energy has been very creative by setting up deals with major (mostly foreign) players to fund a portion of its drilling expenses, but the company has vast acreage to explore and produce. Will that strategy “scale?” At some point, will Chesapeake have to sell so much that it becomes a sharecropper on its own leases? Perhaps that language is a bit harsh, but it seems that CHK is moving towards being a contract producer where it gains first mover advantage by leasing land, starting drilling operations, and then bringing in a partner before really blowing it out. I suppose that once the company gets the leases held by production it can develop the leases in a methodical, capital efficient manner. But that doesn’t seem like Chesapeake’s style. Ultimately they might farm out the capital risk of the “factory operations” phase to another company and stay on to operate the production of the fields in a less financially risky capacity. I don’t see CHK selling out, but I do see the company looking for creative ways to continue to shift the capital risk on the proverbial car they’ve caught. As I've mentioned before, CHK looks more like a private equity investment manager than an E&P company to me. The song that pops in my head is the Christian hymn “What a Friend We Have in Jesus.” Please don’t think me a heathen, but from the perspective of domestic natural gas, I’m singing, “What a Friend We Have in Exxon.” Exxon is no stranger to natural gas, but with this transaction it is going from ninth biggest U.S. gas producer to numero uno. Based on the WSJ’s chart below, in the first half of 2009, Exxon would have produced 3.53 Bcf/day of gas combined with XTO, 51% more than second place BP. Suddenly, Exxon joins Aubrey McClendon (CHK) and Boone Pickens in becoming a big domestic natural gas advocate. Exxon has strong pull in Washington, and it’s nice to befriend the #1 Fortune 500 company. It's one thing when Aubrey McClendon goes to Washington but something entirely different when it's Rex Tillerson sitting in front of a Congressional committee (nothing against Aubrey). Another potential positive of this deal and others like it is that it could bring stabilization to gas commodity prices. One of the biggest issues natural gas has is price volatility, as witnessed by past 18 months. Without some price stability, many potential users will resist switching to gas. As an analyst interviewed for another WSJ article pointed out, “If the Exxon deal prompts other large, integrated oil and gas companies to enter the shale gas industry, the volatility in natural gas prices could subside five to 10 years from now…(t)he gas exploration-and-production sector would become better funded and dominated by fewer players.” The analyst in question sees long-term NG prices around $7/MMBtu. The belief is that bigger players have longer-term time horizons and can fund exploration when commodity prices are low. They are not as vulnerable to the whipsaw nature of commodity price fluctuations. The next few months will be very interesting, so stay tuned. Outside of the questions of business strategy, El Paso had good news to report on the production side at its recent analyst meeting. The company controls approximately 40,000 net acres, mostly in north Louisiana with 17 operating wells and prospects for 269 more, based on 160 acre spacing. El Paso's 2010 capital expenditure in the Haynesville region is $248 million (of $1.1 billion total E&P capex budget), which should yield approximately 41 gross wells. The company has five rigs working at this time. Its best results have been in the Holly Field in DeSoto Parish, where it is estimating ultimate recoveries of 6.5 to 7.5 Bcfe. Elsewhere in its Haynesville properties, EURs run between 5 and 6 Bcfe. 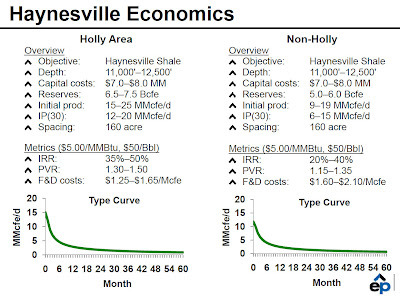 El Paso estimates that it's Haynesville breakeven commodity price (with a 12% internal rate of return) is around $3.90/Mcf. The company has been successful in its efforts to gain efficiencies through successful cost and time reductions. Average well cost for Q3 2009 was $7.4 million, even as it has expanded its well completion techniques. The company now uses 14 completion stages for most wells, with laterals greater than 4,000 feet. Flow rate has increased from 40 bpm to 80 bpm, fluid has increased from 10 to 15 MBbl per stage and proppant has increased from 250,000 to 380,000 pounds per stage. On Friday I read an article in the Wall Street Journal about the El Paso Corp. analyst presentation that summarized the company's business strategy as "shrink to grow." El Paso will focus its resources on growing its domestic gas business at the expense of some of its other business lines and its own profitability. The company will stick to its 2010 plan to spend $4.1 billion in capital, a figure that well outstrips its self-generated cash flow. As a result, the company likely will have to sell assets to cover the shortfall. That's a bit dicey to me. This is not unlike the strategy of Devon Energy, which is selling its Gulf of Mexico and international operations to focus on domestic gas. I like to see the increased strategic focus on domestic natural gas, but seeing so many companies follow this strategy, I'm starting to wonder if it is a "golden opportunity strategy" or an "our back is against the wall strategy." As I noted earlier today, El Paso believes our nation's energy future = natural gas. Of course, if your business is all about natural gas, I hope that is your belief. I happen to agree with this concept and think it is more than just salesmanship. But I'm starting to get this creeping feeling that the big natural gas independents are finding themselves skating on thin ice. They've spent billions tying up leases, exploring and drilling. But the reward for their unprecedented success has been a natural gas supply glut that has killed commodity prices. Some of that can be blamed on the recession and a temperate summer, but we saw NG storage hit 99% capacity with voluntary production curtailments in place. Think of what would have happened if they produced with the spigot open? The news yesterday that Exxon is buying XTO is something of a double edged sword. It is validation that the shale gas phenomenon (at least from a supply perspective) is real. But it might also be an indication that the big gas independents won't be able to go it alone. Will they be able to survive another summer of $2.50 NG and curtailed production? Not if they're outspending their cash flow. In the past, I have expressed concern about the future viability of the small NG independents, but now I wonder whose days are really numbered? I was doing some research on El Paso for another post when I read the company's "Macro View" presentation as part of its analyst presentation last week. Rather than paste a bunch of the slides here, here's the link so you can look at the whole thing. It is relatively short and mostly self-explanatory. Definitely worth a few minutes. The bottom line: gas demand will be driven by electricity demand and gas supply will be driven by unconventional production, including shales. An article in the Shreveport Times last week noted the recent Louisiana Mineral Board auction of leases for public land, where a lease for 185.6 acres scattered around the Mansfield area of DeSoto Parish went to Classic Petroleum for a $18,537 per acre lease bonus and a 25% royalty. It is worth mentioning that some of the best wells have been found in this area, so it might not be a telling sign, but by comparison, recent lease bids have been coming in around $8,000 to $9,000 per acre. It's not likely that lease bonuses will get back up to $25,000 to $30,000 per acre, but it still seems like a good sign. The recent Mineral Board lease included 14 leases in the Haynesville area. More lease sales are expected in January and February 2010. For those concerned about local governments receiving a sudden windfall, please note that the money going to the DeSoto Parish school board is required to go to a trust fund to fund future retiree benefits. In a consolidation of the letter "X" on the Big Board, Exxon (NYSE: XOM) has agreed to purchase XTO Energy (NYSE: XTO). The purchase values XTO at $31 billion ($51.69/share), but since it is a stock for stock transaction, the numbers will slide around before closing. This is big for lots of reasons. First, it is an acknowledgement from the biggest of the supermajors that domestic natural gas is for real. The big guys (supermajors) have been letting the kids (natural gas independents) play in the sandbox, but this move is an admission that it's time for the big boys to take over. Previously we've seen joint ventures between big players and independents, but this is completely different. It might also kick off a wave of consolidation. The market analysts has been talking about consolidation for the past year as gas prices and rig counts plummeted. That it hasn't come to fruition is something of a surprise. Exxon is the big dog in the industry. How will the other dogs in the pack respond? If the moderate XTO price is an indication, other independents might fall. Ultimately, this move is an acknowledgement that natural gas is going to be a big part of the energy future. By making this acquisition, Exxon is getting away from its past business strategy. To me, that is a direct comment that the landscape is shifting towards gas. Exxon may have made a good deal for lots of different reasons. The Financial Times has a good piece on this too. I used to read Popular Mechanics as a kid, but I haven't paid much attention to it in a long time as more distractions creeped into my life. I was intrigued the other day when I spotted an article called, "The Myth of Clean Coal: Analysis" on the PM web site. It's a good read. The article makes a bunch of good points (like "A recent study concluded that coal emissions contribute to 10,000 premature deaths in the United States each year.") While "clean coal" makes little economic or scientific sense, it makes great political sense. The author compares the "clean coal" boondoggle to enact corn-based methanol mandates, "legislation that employs appealing buzzwords to justify subsidies to a politically favored constituency—while actually worsening the problem it seeks to solve." But the core of the story is the discussion of the physical merits of "clean coal" and how it really doesn't work on a large scale. It's hard to capture carbon from coal plant exhaust and converting the carbon to a disposable form would require huge amounts of power and storage capacity. Ultimately "clean coal" would require burning (and mining) even more coal. If I'm a coal company, I'm all over "clean coal." Bottom line: "The focus on mythical clean coal is particularly frustrating because practical, cost-effective alternatives do exist." He goes on to discuss natural gas, nuclear power and conservation. Ultimately, it's frustrating to me because "clean coal" is just a marketing trick that digs us deeper in the hole. As I learned from a cagey lawyer early in my career, "the first rule of holes is that when you realize you're in one, stop digging." We need to stop digging. …And his first move is to commission a study to find ways to keep international gas contracts indexed to the price of oil. Go figure. The Gas Exporting Countries Forum is trying to become a natural gas cartel on the same lines as OPEC. The group met yesterday in Doha, Qatar and for the first time selected a General Secretary, Leonid V. Bokhanovsky, a vice president at Russian pipeline company Stroytransgaz. That a Russian took the helm of the organization is not a huge surprise given the importance of gas to that nation. Russia, specifically Gazprom, the government controlled gas company, has been losing gas market share for the past year. An ample (and growing) supply of natural gas has created a more fluid spot market in Europe, causing gas consumers to pressure suppliers for lower prices than those from long-term contracts pegged to the price of oil. A legitimate natural gas market is being created by increased supply and improved transportation (LNG), thus increasing downward pressure on prices. Suddenly, Russia finds itself on the wrong side of history. A free market is growing organically and Russia and other gas producing countries want to put a halt to it. But it’s hard to stuff the genie back into the bottle. I’ve suggested in the past that gas is a democratic fuel because it’s available throughout the world, and not just in countries with autocratic, controlling governments. The more widespread gas production, the more likely we will be to see a free market and the harder it will be to create a cartel. The weekly EIA natural gas in storage number showed the storage level decreasing by 64 Bcf to 3.773 Tcf. While this is slightly less than last year's withdrawal of 66 Bcf and the five year average of 90 Bcf, at least it's heading in the right direction. It's nice to see the red line on the chart below finally going down. While I'm happy to see things trending in the right direction, I acknowledge that without new sources of demand this will be an annual exercise in frustration. I've been following the natural gas supply glut drama in both the U.S. and the U.K. lately. Yesterday's headline was that the spot gas price in the U.K. fell to 30 pence/therm, the first time it has ever gone below the U.S. Henry Hub spot price (don't ask me to do the pence/therm to $/MMBtu conversion - I'll just trust Merrill Lynch and the Financial Times). The supply glut in Britain is linked to the influx of LNG that can't find a home in North America. Qatar quickly has gone from zero to the second largest supplier of gas to the U.K. in a year. The problem grows worse as other countries expand LNG export capacity. Most troubling is that the two countries that could soak it up, India and China, have inadequate LNG import infrastructure. Now there's a business opportunity if you've got a couple billion dollars burning a hole in your pocket! First, regarding price, the EIA doesn't have a crystal ball. It seems to do a statistical analysis of futures prices to estimate next year's spot price. While that price would be 17% higher than the estimated 2009 average spot price of $3.95/Mcf, it is still fairly low and likely will not lead to much natural gas investment outside of low cost plays. Second, in terms of consumption, the EIA expects 2009 consumption to drop 1.9% from 2008 and another 0.4% in 2010. Industrial consumption was way down in 2010, but fuel switching by power plants from coal to natural gas partially offset the loss. With seasonal price increases and an oversupply of coal, the fuel switching has ceased. Next year, the EIA expects industrial, residential and commercial consumption to pick back up but power plant consumption to drop. Last, in terms of production, the EIA estimates that 2009 production was up 3.7%, even with the more than 50% decrease in working rigs. The projected 2010 production decrease is based more on market-driven issues than quality of supply or depletion issues. The article noted how inexpensive geothermal power is relative to other fuels. What struck me is that a modern gas plant is as cheap as geothermal, $60 per megawatt hour. Geothermal has the advantage of not producing pollution other than heat, but I was pleasantly surprised by the economics. I don't know what went into this calculation, provided by investment bank HSBC, but it seems to include capital costs as well as operating costs. I've always heard that gas plants are cheaper to build than coal plants but can be more expensive to run depending on the commodity price of gas. The timeframe for this analysis is from July 2008 to June 2009, so it includes $13 gas as well as $4 gas (but no $2 gas), so that didn't sway the economics significantly. This is a strong statement in favor of gas power generation. Perhaps the WSJ can get TWO stories from ONE chart! Last night, while flipping through my growing magazine stack, I happened upon a very interesting article in Fortune on John Arnold, the former Enron trader who founded Centaurus Energy and has made a multi-billion dollar killing trading natural gas futures and derivatives over the past few years. The article is as much a profile of the man and his firm as it is a discussion of the possibility of the Commodity Futures Trading Commission (CFTC) implementing controls to rein in large scale speculation, which partly has been blamed for high levels of commodity price volatility. The article traces how the past decade has seen the creation of immense profits and huge flameouts (remember Amaranth in 2006?) in a trading market originally designed to help gas users hedge their price exposure. Following the 2000 Futures Modernization Act, a.k.a. the "Enron Loophole," trading activity has exploded and is now dominated by profit-seeking speculators rather than profit-protecting operating companies. Hey, that's how the free market works. A friend of mine who is both an academic and a trader noted that a new generation of students are going through business schools wanting to be traders. It's the "new black." The fashion used to be consulting, then investment banking, then venture capital, then hedge funds, now trading. Her lament is that many schools are teaching profit-based trading rather than fundamentals-based trading. Graduates will be gunslingers, only equipped to seek a fast profit. They will not be able to operate a more nuanced hedging portfolio. It's sort of like turning out mercenaries instead of trained soldiers. As more people seek profit in the commodity trading busiess, you risk seeing the fundamentals of the commodities market become the "tail" to the trader's "dog." Something's got to give. Perfect for a Monday morning is a short article on the Houston Chronicle web site about market factors cutting against natural gas right now, including less switching from coal-generated power, lower gas consumption, high projected LNG cargoes, blah, blah, blah. Most alarming is the projected increases in LNG production (note that the horizontal axis is wrong and the last year on the right should be Jan-10 not Jan-09). This is not new news, but it's neatly packaged to make gas fans feel woozy first thing in the morning. Vaughn GU #1, Samson Lone Star; Waskom Field, Harrison Co. Miles Bell #1 H, Chesapeake Operating; North Carthage Field, Panola Co.
D. Verhalen #3 H, GMX Resources; North Carthage Field, Harrison Co. In an effort to provide more information that would interest a Haynesville Shale Fan, I've posted the weekly Baker Hughes rig listing for the Haynesville area. It is not perfect, but it's a start. I took out some of the parishes/counties that are less likely to contain the Haynesville Play and I've also eliminated rigs obviously not targeting the Haynesville (i.e. targeting oil). Where there are errors, they should be errors of TMI, not omission. There might still be rigs targeting Hosston, Cotton Valley, James Lime, etc. on the list, but the majority are Haynesville rigs. By this metric, this week I counted 156 rigs in the area (did I mention that this number likely is high?). I'm not ready to hang my hat on this being an absolute figure, but it gives you an idea of what's going on where. The link will be in the upper right hand corner of the page and will be updated weekly. 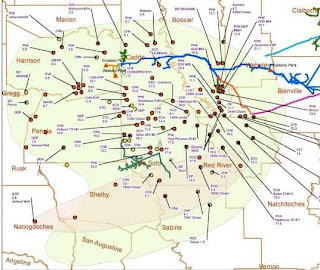 Yesterday, Goodrich Petroleum announced that it is acquiring 12,000 net acres in Nacogdoches and Angelina Counties, TX that the company believes is prospective for the Haynesville Shale. With the soon to close transaction, Goodrich will have 85,000 net Haynesville acres. The purchase will bring net Haynesville acreage in the Angelina River Trend to 22,000 acres. The company plans to drill this land in the first half of 2010. Goodrich announced that its preliminary 2010 capital budget will be $230 million, the same as its 2009 budget. This budget should fund 46 gross (24 net) horizontal wells. Approximately two-thirds of this will be spent in Caddo and DeSoto Parishes, LA. Of the $230 million, $190 million will go to drilling and completion and $40 million will go to leasehold and infrastructure. I noted the following new completions in Louisiana. These have been added to the completions database and some of the missing information from Sunday's new completions has been added. The weekly storage number just won't stop going up! It was up 2 Bcf last week, bringing the total (and all-time high) to 3.837 Tcf. This is starting to get scary. Last year this comparable week, storage dropped 65 Bcf. The five year average for the comparable week is a 43 Bcf withdrawal. Breaking it down by region, the East region saw a 7 Bcf withdrawal, the West region saw a 1 Bcf injection and the Producing region saw an 8 Bcf injection. Warmer than usual temperatures again seemed to be the culprit. Just look at the 8 to 12 degree temperature deviations across the Upper Midwest and Northeast. Reuters UK has a good article on how the high natural gas supply is changing the power generation landscape in Britain this winter. Utility Centrica is running its gas powered generating plants full tilt this winter to take advantage of the surplus of low priced natural gas in the U.K. Normally winter sees gas prices spike as gas is used to heat homes. Coal then becomes the baseline power generation fuel of choice because it is cheaper. Not this winter. Because of the influx of LNG to the spot market, the gas price spike is not expected to hit and gas turbines become moneymakers in the cold months. The article is a good read because it provides more insight on the global gas market and the tight spot LNG providers find themselves. Demand for natural gas has slacked because of the global recession at the same time supply from nations like Qatar has increased. Non-contracted gas is still being loaded onto ships and is looking for a home. Because European continental users are tied to pipeline supply deals with nations like Russia, they can't absorb excess spot market gas supply (although they would like to because the pipeline contracts carry oil-indexed prices). The U.S. is not an attractive destination because of its oversupply/low price situation. The next best option is the U.K., which has one of the better gas spot markets in the world. Storage there is filling up and opportunities abound to use the cheap gas. Here is an article noting the opening of a BP office in Hallsville, TX (Harrison Co.) to consolidate its east Texas and west Louisiana operations. While this is not huge news in itself, the article notes that BP put its first Haynesville well into production on November 10. BP has been under the radar in the Haynesville Shale, so it will be interesting to see what they're up to. BP is one of North America's largest gas producers, but it has been largely silent on its position in the Haynesville Play. The map below from the company's web site offers a snapshot of its leasehold. It is unclear, however, how much of that leased land includes deep rights. I'll be on the case, though. It looks like the big increase in the Henry Hub spot price on Monday (+30%) was the result of the Energy Information Agency's monthly production release, which showed a production decline of 2% in the Lower 48 in September 2009. All states saw production declines except for Louisiana, because of the Haynesville Shale (link to report). Analysts have been waiting...and waiting...and waiting for production declines to follow the dramatic decrease in rig counts. They've been foiled to this point by high producing shale wells that just keep adding to production. The first big Qatari LNG tanker arrived on U.S. shores at Sabine Pass, LA on November 4. Qatar is leasing space there while it's Golden Pass terminal in Texas is under construction. Qatar's net gas extraction cost is about 15 cents per MMBtu (it makes most of its money through natural gas liquids). It's liquefaction cost is about $2.83/MMBtu. I don't think that cost includes shipping, but this implies that gas is loaded on the boat for about $3/MMBtu. Not bad economics. Qatar is highly dependent on spot market sales because of a poor strategic decision several years ago. As gas commodity prices were rising and Qatar was making huge investments in natural gas extraction and liquefaction, it did not lock in forward sales contracts. Instead it expected prices to keep rising. Bad move (sounds like mortgage brokers and the U.S. housing market). But that self-inflicted greed wound has caused collateral damage to producers in North America because now Qatar is dumping cheap gas into the spot market. The Gas Exporting Countries Forum is meeting in Doha, Qatar next week. It looks like the 11 member nations are working towards creating an international price-controlling body like OPEC. They may not be very successful, however, especially now that gas has become more "democratized," with gas finds all over the globe. They also won't be able to hold a gun to the head of the U.S. since we are self-sustaining where it comes to natural gas. But I'm sure China and India are watching these developments closely. As reported by the Houston Chronicle, the House of Representatives passed a bill to fund research into improving the efficiency of natural gas power turbines operating at 2,600 degrees from 60% to 65%. Higher efficiency turbines allow more of the gas to be converted into power and less to be lost. An similar research effort in the early 1990's boosted efficiencies between 2,300 and 2,600 degrees to 60%, a significant improvement at the time. There are those who balk at government supported research and development, but this to me is money well spent. First, we should always strive to make electricity production more efficient. Using less of any fuel to create the same amount of power is always better, and simple efficiencies can be scaled up to create huge savings. Second, this is another spoke in the wheel for natural gas. If gas is to be the go-to fuel for the next few decades, it should be married to the latest technology. Third, the energy technology business is very competitive internationally and is one of the few real growth industries out there. Where other nations are taking the lead in solar and wind technology, I don't see anyone leading in natural gas. Just like we are in a position to export our shale exploration technolgy throughout the world, we should also export our gas-power generation technolgy. It's another opportunity for the U.S. to take the lead. North Carolina based utility Progress Energy said that it will close 11 coal-fired electric plants representing 1,500 megawatts by 2017 (here is a good article from Reuters with lots more details). Many of these plants are old and retrofitting them with updated pollution controls will be expensive. The company seems to be making a bet that Congress will pass some sort of carbon reduction legislation and that the price of natural gas will remain low for the foreseeable future. While it's a simple statement to close 30% of your coal fleet in North Carolina, it's actually a fairly complex wager. First, the company would be taking a substantial risk in closing a coal plant before carbon reduction legislation is finalized. One of the major policy discussions is how to set the baseline to measure progress in reducing carbon output. It's not something that has been well measured until recently and there may have been inconsistent measurement standards in the past. To me, this points to a baseline in the present, either 2009 or 2010. But if you close a coal plant before then, you reduce your baseline carbon output and therefore don't get credit for the reduction and, worse, have to enact more cuts to meet goals. Having that uncertainty out there is going to keep other big coal users on the fence. Second, Progress is banking on natural gas prices remaining both low and less volatile. I'm sure the company's economists have pored over data and are projecting just this kind of scenario. At least one new gas-fired plant is planned, but it is likely for Progress Energy that natural gas will be a bridge fuel not to alternatives but to nuclear power. Progress is planning two nuclear reactors in North Carolina and more in Florida.